In the midst of all that, my plane landed at 7:45 after only a brief delay and rolled directly to a gate. My luggage was delivered promptly. When I called the hotel, I got through immediately -- twice! Apparently I came in during a brief break in the storm. I didn't even realize there was a problem until the family sharing the shuttle with me explained that their connecting flight to Florida had been cancelled. According to the schedule, I should have been one of the last to arrive, then we'd all go out for dinner around 8:30. Instead we went to IHOP for breakfast at 1 a.m. -- without Zeb, who didn't reach the hotel until we were leaving the restaurant. We brought him a burger. If you don't want an 8 a.m. start for a game, tell the event organizer beforehand. I live in Seattle. 8 a.m. in Fort Worth is 6 a.m. in Seattle. 'Nuff said. Chainmail's morale rules don't make any more sense now than they did in the '70s. Marshall Mahurin ran a beautiful miniatures game of the Battle of Lonely Mountain (Five Armies) using the Chaimail rules. Chainmail was a rather elegant set of rules for its time and still holds up reasonably well in every regard but one. Its clunky, unintuitive, difficult-to-use morale rules are completely out of line with everything else in the game. Why Gygax and Perren wedded their smooth movement and combat rules to those awful morale rules will forever be a mystery. Judges Guild published a lot of junk, but the swill concealed an occasional truffle. 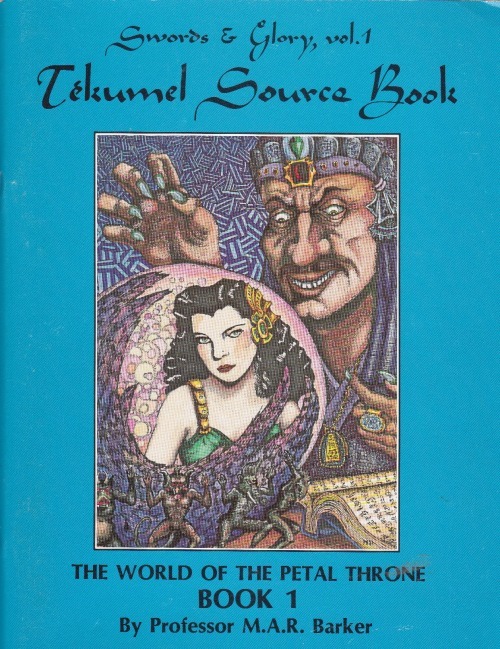 When I started working at TSR, we had to review everything that Judges Guild intended to publish for D&D. Being assigned to work on JG material was like KP; a stack of Judges Guild manuscripts would be dumped on your desk if you screwed up on something. The quality varied from mostly to only partly awful. I have a soft spot for it now, thanks to the rosy tint of time. Its awfulness has gained a patina of innocent charm. That's especially true for a booklet like the D&D Ready Ref Sheets (1978), which I picked up at the show. Where else will you find 50 pages of random tables and optional rules covering social levels, crime and punishment, witticisms and repartee, information to be gleaned from beggars, reasons why NPCs are angry, types of caves, 180 varieties of trees, and six different types of refuse (offal, sewage, parts, discards, food, and fuel, each with its own subtable). I dismissed such things as monkey doodles in the 1970s. Now, I find it fascinating. The simple fact that such tables exist makes me want to use them. A monster's toughness and importance to the adventure is a perfect indicator of how many single-digit numbers I'll roll for it on a d20. Case in point: The characters in my adventure "An Emperor's Doom" faced a 12-headed hydra, one of the more ferocious monsters in Expert D&D. They were palpably concerned when they found out what they were up against. It died on round 2 of the fight, having attacked four times and inflicted 8 points of damage. With average luck on my part, it could have rolled 16-20 attacks. After that, I made Allan Grohe roll all the saving throws for the major villain of the adventure, to preserve some drama. If I'd rolled them, the climax would have been flatter than last week's beer. Adventure twists and details that you come up with on the spot, in reaction to the player's actions, are always better than what you wrote ahead of time. No matter how much I plan for contingencies, players still surprise me. The better the players, the truer this becomes. Players at NTRPGCon are among the best I've had the pleasure of DMing for. Few experiences from behind the screen are more enjoyable than closing the score and riffing off the players. Like live jazz, the resulting performance is far more exciting and collaborative than the planned studio recording could have been. There's no telling who you might meet in the hotel bar. The world is full of people who played D&D in their youth but grew up, moved into successful careers, and left imaginary adventures behind -- until they see a group of fellow grownups rolling dice, drawing maps, pushing miniatures, and having the time of their lives. Then they remember the thrill of being 14 and believing you can cast lightning bolts through your fingertips and slay dragons with a sword of frost. Ties get loosened, drinks get bought, and stories of grand adventure get told enthusiastically for the first time in years. Gamers are smart, funny, cool people. A small convention like NTRPGCon displays those qualities better than any other venue. Of course gaming is a big part of the show, but hanging out with folk, chatting about times old and new, and swapping stories over food and drink are every bit as gratifying. Hey Steve, thanks for participating in the 2e Q&A session (and any others you did). I'm watching it the video of it on youtube right now, and enjoying the anecdotes. I never noticed the 1e Anhkheg -> 2e Ankheg name change, lol! Some aspects of 2nd edition AD&D make it appear to be designed with higher-level play in mind, compared to the typical level range that 1st edition campaigns achieved. Specifically, I'm thinking of 2nd edition changes like higher (or non-existent) racial level limits, introduction of damage caps on various spells, more powerful dragons, and more powerful giants. Was there an intentional decision to change the way very high level play worked, and if so can you talk a little bit about what motivated that change? Was there external pressure from players about that level range? Did experiences with the various high level modules from the mid/late 1980's have anything to do with it? (Offhand, I'm thinking of the H-series Bloodstone modules; there may have been others.) Or perhaps feedback from players using the Companion / Masters sets? Yes, there definitely was a conscious attempt to change the way AD&D functioned at higher levels in 2nd Ed. It wasn't motivated by pressure from outside. Zeb and I both felt that 1st Ed fell apart as characters climbed into the mid-teens. Not everyone agreed. I had a conversation with Frank Mentzer at the convention, for example, and Frank has been running a high-level 1st Ed. campaign (level 20+) for years without trouble. Frank's an exceptional DM with a crew of exceptional players, so his track record can't be considered typical. The problems were mostly mathematical; the numbers just stopped working the way they were meant to when characters had access to 25-30 spells/day and bags of holding filled with magic items accrued over 15+ levels of rolling on the magic item tables. There's no good solution to the problem of generous DMs, but we tried to rein in some of the institutionalized excesses of the game. The H-series adventures didn't highlight any problems we weren't already aware of. It was more like they reveled in them. Their approach was along the lines of, "Oh, you like this sort of thing? Well then you're gonna love this ..."
Ha! Yes, my wife and I have suffered at the hands of the [i]Chain Mail[/i] morale rules in recent weeks. Biggest change we have made is to only allow the losing side to suffer the consequences of the post close combat morale calculations. Still, a fun game. Dang the more I hear about this, the madder I get that I didn't have a chance to go there. Hopefully, they'll do another Con down in San Marcos like last year. Steve! I enjoyed finally getting to game with you after just passing you in NTRPG hallways the last few years. I played in Emperor's Doom and the Star Frontiers games & you watched Zeb trounce my tactics in Chainmail. I really enjoyed "An Emperor's Doom," it had all the mythic elements tied in with a Greek multiple task like quest. Without spoiling the story for anyone else, was the 'element' that two of us split off the party to go acquire for our cause in the end game a written part of the module or was that one of the spur of the moment situational changes? Thanks for the fun! Chris. Cool! I could see a sequel to that adventure and if I may suggest that a tie in with a Chainmail battle would be a hit flavor of ice cream! I have 'The Dark Abbot of Kos' but did not get to play it yet and therefore have not even read it (just in case I can play it!). Do these two modules work together? Lastly, should some incredibly lucky circumstance allow you to be in Southern California in late July you would certainly be welcome for two days of gamin' fun at our mini-con! The two adventures are related only in that they both take place in the Milenian Empire and they follow the exploits of the same group of pregenerated heroes. Even those links exist only because that's how I ran things in Dallas. In a different setting, they could stand entirely alone. The Lydia link pleases me to no end, but so far it has no other significance. Steve thanks once again for showing up to our little con for some gaming. It was great having you and Zeb talk about the origins of 2E (always good to get the facts from the horse's mouth) and once again you ran more than your fair share of games! Hope to see you again next year in our new awesome digs (quite a step up from this year, check out the forums). And it was great finally meeting Zeb although I fear I was a little awestruck and just ended up mumbling a bunch of nonsense everytime I tried to communicate with him during the con!